When exploring the failure of businesses in both the private and public sector to absorb the growing number of job seekers in SA, increased attention is focused on entrepreneurship and its potential in contributing to economic growth as well as job creation (Ramukumba 2014). Despite the contributions of new small and medium enterprises (SMEs), their failure rate in SA is among the highest in the world. About 75% of new SMEs do not become established formal businesses (Snyman, Schutte & Leipzig 2014). According to Olawale and Garwe (2010), the probability of a new SME surviving in the early stages of its existence, is less than any other Global Entrepreneurship Monitored (GEM) sampled country, as listed in the 2015/2016 Global Report. Grouping by geographic region and economic development level, these include Botswana and Morocco (in Africa), India, China and Australia (in Asia and Oceania), Argentina (in Latin America and Caribbean), Bulgaria and Belgium (in Europe), as well as Canada (in North America). While the GEM reports, among others, presents the entrepreneurial behaviour and attitudes of individual business owners, it raises a question as to whether running a small business leads to the fulfillment of personal goals. Arguably, this may depend, on one hand, whether there is a link between small business owners' goals and motivations or, on the other hand, the business outcomes. Hence, this study examines whether small business growth is a function of the small business owner's personal ability to grow the business. It investigates the intrinsic motivational factors that influence SME growth in SA. According to Nieman and Nieuwenhuizen (2014), growth and the desire to grow should be embedded in the mindset of the person starting or creating a new business venture. Growth will intensify the demands made on the resources, which can only be countered by an ability to attract resources. Growth and performance are generally seen as substitutes for each other. A growing business is usually considered to be a successful business that performs well (Nieman & Nieuwenhuizen 2014). 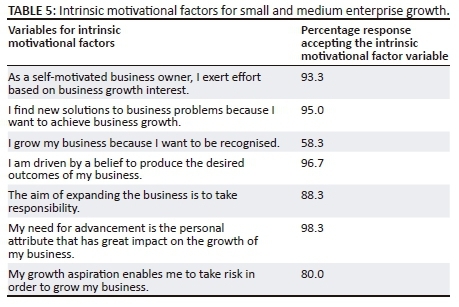 However, this study considers the following objectives: to determine the influence of self-motivation of business owners for SME growth and to establish whether the intrinsic motivational factors of business owners influence SME growth. SME owners are likely to be intrinsically motivated if they attribute their business growth to factors under their own control, believe that they have the skills to be effective agents in reaching their desired goals, and are interested in growing a business, not just in achieving wealth (Grant & Berry 2011). Wiklund, Patzelt and Shepherd (2009) add that self-motivation is the need for self-fulfillment. Motivation is a process that accounts for an individual's intensity, direction and persistence of effort towards attaining a goal (Robbins, Odendaal & Roodt 2011). Intensity is concerned with how hard a person tries. However, high intensity is unlikely to lead to job performance outcomes unless the effort is channeled in a direction. Robbins et al. (2011) add that the persistency dimension measures how long a person can maintain their effort. Motivated individuals stay with a task long enough to achieve their goal. Hence, the needs theory of McClelland and Koestner (1992) contends that individuals are motivated by three basic drives: achievement, affiliation and power. Tu and Lu (2014) argue that these needs not only motivate individuals but also include many of the most important human goals and concerns. This research attempts to demonstrate that each of these need dimensions affects the level of accountability a person feels for himself or herself and others. However, this section will only focus on the achievement and power needs as they are relevant to SME growth (Pinder 2014). The need for achievement describes a person's drive to excel with respect to some established set of standards (Bande et al. 2016). It refers to the motive to do well and achieve a goal relative to a set of standards. The inclusion of measures of achievement orientation within the framework of entrepreneurs' personal characteristics is consistent with this research. The need to achieve reflects individuals' orientation, the willingness and drive for satisfaction or a sense of accomplishment (Pinder 2014). This is demonstrated by the exertion of intense, prolonged and repeated efforts to accomplish something difficult, whether by skill, practice or perseverance. This is accomplished by a future-oriented dedication to the task involving prioritisation of accomplishing the task and frequently sacrificing other activities and personal time (Royle & Hall 2012). Individuals' achievement needs are satisfied when they are able to actualise their own purposes relative to and regardless of the situations of others (Pinder 2014). Individuals with high achievement needs do not like to prosper by chance but rather seek personally identifiable sources for their success and cannot leave the outcome to probability (Royle & Fox 2011). Such individuals experience joy or sadness contingent upon the identifiable outcomes of their efforts (McClelland & Koestner 1992). The need for power denotes individuals' desire to be influential. This could manifest itself in attempts to make others behave as one would like or in a manner that they might not have done otherwise (McClelland & Koestner 1992). In other words, the individuals that are high in this need seek position power so that they can compel the actions of others. Those high in power needs prefer being in competitive, status-driven situations, and actively seek the trappings of status (Royle & Hall 2012). They are concerned with ensuring that the methods they choose to influence others are within their control (Csikszentmihalyi & Wong 2014). However, in order to maintain viable interdependent relationships with others, individuals with high power needs must often restrain these desires (Royle & Hall 2012). Central to one's need for power is gaining influence over others. Individuals with influence can then parlay informal accountability for others into the accumulation of additional resources that serve to enhance their status. Consequently, this study examines business owners' influential behaviour that is related to SME growth. In work settings, productivity can be increased by using extrinsic rewards such as bonuses, but the actual quality of the work performed is influenced by intrinsic factors (Pinder 2014). If one is doing something that one finds rewarding, interesting and challenging, one is more likely to come up with novel ideas and creative solutions (Csikszentmihalyi & Wong 2014). Management's motivation, creativity and skills have an influence on the way a business is managed or mismanaged. Insufficient and inappropriate skills of management could cause failure in businesses (Arasti, Zandi & Talebi 2012). Motivation, in this case, refers to a process that elicits control and sustains certain behaviours (Zimmerman & Chu 2013). It can either be extrinsic or intrinsic in nature. Extrinsic motivation has a stronger relationship with material factors, while the individual in the intrinsic position attempts to fulfill his or her aims in life (Becchetti, Castriota & Tortia 2013). 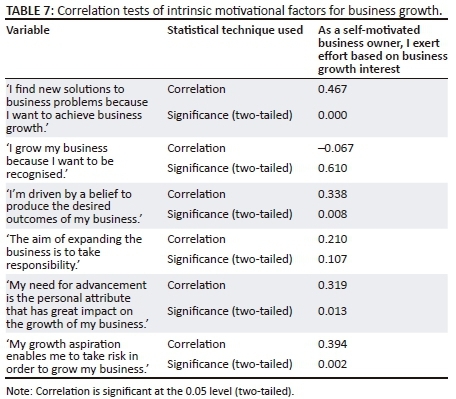 This study determines whether intrinsic motivation influence SME growth. It must be noted that human motivation plays a critical role in the entrepreneurial process (Antonites & Van Vuuren 2014). Grant and Berry (2011) have stressed the importance of entrepreneurial intentions as a forerunner to establishing a new venture, thus highlighting the importance of what motivates a person to grow a business. Consequently, Tu and Lu (2014) provide clarity in that motivation plays an important part in the creation of new businesses. They indicate that theories of business creation that fail to address this notion are incomplete. Intrinsic motivation occurs when one acts without any obvious external rewards (Zimmerman & Chu 2013). It refers to the reason why one performs certain activities for inherent satisfaction or pleasure (Hennessey 2010). It arises from the individual's positive reaction to the task itself such as interest, involvement, curiosity, satisfaction, or positive challenge, which serves as a type of reward for the work (Grant & Berry 2011). From the Self Determination Theory, intrinsic motivation is central to the proactive, growth-oriented nature of human beings, which is the basis for learning and development (Deci & Ryan 2011). SME growth increases a business's sustainability. A reliability analysis Cronbach's alpha of 0.676 was achieved. This value is close to 0.7 and indicates an internal consistency and reliability of the variables in this objective. A reliability analysis Cronbach's alpha of 0.626 was achieved. This value is also close to 0.7 and indicates an internal consistency and reliability of the variables in this objective. The bivariate Pearson correlation analyses were used to examine the strength of the identified association between variables (Dawson 2009). These tests were used to find any significant relationship between study variables. They include the relationship of both the self-motivation and intrinsic motivational factors of business owners with SME growth. The bivariate Pearson's correlation can reveal the significance of the correlation and, if it is significant, whether it is positive or negative (i.e. the direction of the correlation) as well as the strength of the correlation. The variable relating to self-motivated SME owners who are likely to grow their businesses does not have a significant relationship with the variable on SME owners' interest in learning to enhance willingness to take risks (at p < 0.05). 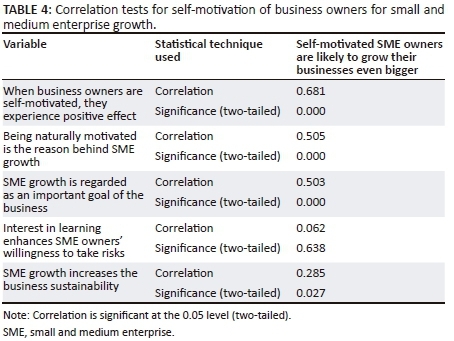 This analysis indicates that an interest in learning by self-motivated SME owners has no relation to business growth. 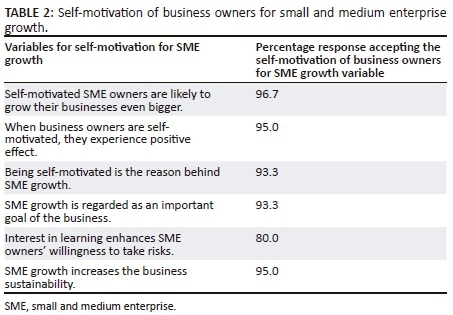 This article investigated the influence of self-motivation and intrinsic motivational factors of business owners for SME growth. One hundred and twelve SME owners of furniture manufacturing businesses operating in the eThekwini Metropolitan Area in KwaZulu-Natal participated in the study. The findings indicate that if SME owners are intrinsically motivated, they exert effort based on business growth interests. They find solutions to business problems because they want to achieve growth. This gives an indication that the level of SME owners' motivation is crucial for SME growth in SA. In addition, it reveals that SME owners are self-motivated in growing their businesses. This is in line with the assertion of Abor and Quartey (2010) that SME growth is closely associated with overall business success and survival. The need to achieve success is the motive to do well and achieve a goal to a set of standards (Royle 2013). Thus, when SME owners are intrinsically motivated, their desires to learn, explore their interests, and engage their curiosity lead to the focus of novel ideas that help them grow their businesses even bigger. An interest in leaning enhances SME owners' willingness to take risk.